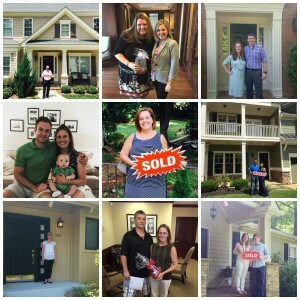 Congrats to The Peters Company July Metro Atlanta Homebuyers! Congrats, Vy and Jenny on purchasing your AMAZING new construction home in Brookhaven! You have known Jennie since your college days at Georgia State, and it means SO much that you put your faith in our team to help you sell and buy! There may have been a few bumps in the road but everything turned out beautifully. We hope you, Madeline and Luke love your home for many, many years. Congratulations, Garry and Kim on your new adorable Ashford Park home! When you met Jennie and Andy at an open house last winter, who knew that you would become great friends and clients over the next few months!? Garry is the epitome of the perfect client, and it probably helps that his mom is a Realtor. So, he understands the life of an agent first hand. The search wasn’t always easy, but we think you found the PERFECT home, and a proposal at the end thrilled all of the girls on the team (Andy was excited too). Congrats again on your new home and upcoming nuptials! Edythe, congrats on buying your very first home! We LOVE your location in Ashford Creek, and are so happy that you stayed in Brookhaven! Your townhouse is the perfect place for you to call home, and we can’t wait to see your “finishing touches!” Thanks for your trust in our team, and congrats, again! Jason and Gini, congratulations on purchasing your very first home together – and it’s a gem! I think it was fate for us to drive into that neighborhood the night we found your home. While the search wasn’t always easy, you literally found the PERFECT blend of each of your styles. Jennie is super jealous of your shiplap ceilings, and we fully expect to be invited to a football party in your amazing “all seasons” room! Congrats, Dave and Tracey on living your dream of owning an amazing home! We love helping family! For years you’ve sent us referrals and clients, and we were so excited to finally get the chance to help YOU buy a house! We know it will be a labor of love, but we are so excited to see the home when you’re finished making it your own! Thanks for your constant trust in our team. You’re the best! Kathy – you did it again! You bought two more investment properties in Buckhead, renovated them and rented them in a matter of weeks. You could do a tv show on how to turn a profit on a rental flip. Cross Creek is a great gated community that has pools, tennis courts and a golf course nestled in beautiful Buckhead yet all close to midtown. Peter and Mary Ann started out in Roswell and ended up in the highly sought after Sibley Forest in East Cobb! What a wonderful way to start your new life together (and your soon to be baby girl) in your lovely new home! It was so fun working with such great friends and seeing your excitement when we found this home. I know you will enjoy this very social neighborhood and the swim/tennis too. A big congratulations to you on your new home and your bundle of joy arriving in November! We are thrilled for your family! When we first met for the buyer consultation and you said you were getting married in May 2016, I thought we would have a lot of months to search for the perfect place to call home. On our first outing, Chris and Katie fell in love with the 2nd house we saw in Brookhaven and closed on it 6 weeks later! You wanted a place you could stay in for a while and you got it – a Brookhaven charmer with a fabulous screened porch, a big deck and a fenced in yard for your dog. And by the way, Go Dawgs! Congratulations you two! We went from new construction to condos and ended up with a fabulous townhome in your dream Brookhaven location! I can’t wait to see your before and after photos once you get your renovations and painting complete! It has the open concept you wanted and soaring ceilings in a quiet, small community. So happy we found you a wonderful place to call home for many years to come! You were a pleasure to work with and I am honored to have been able to help you buy your first home! I am so happy your mom was able to join in and have some fun with us during your exciting adventure! Congratulations, Heather! Rod and Kelly were on the hunt for a family home in Marietta’s famous school districts when they stumbled across a for sale by owner. This turned out to be the best house for your family and some of the nicest sellers I’ve ever worked with in my 12 years of selling real estate! It was just meant to be especially after we saw the Auburn themed basement. They took pride in their home and it was maintained perfectly and nicely renovated on top of that. We all hit it off with each other and they even had you over to meet the neighbors after we went under contract. I know your family will love living in such a well loved home on a quiet cul-de-sac in a wonderful neighborhood with swim and tennis too! Congratulations on your beautiful home! And, special thanks for trusting our team with your sale and new purchase! Did you know? According to the National Association of Realtors, the average real estate agent sells 7 homes per year. The Peters Company has sold over 118 homes so far this year with 18 more under contract and set to close in the coming months. Don’t settle for average! Work with the best, and call us today. ← Just Listed :: Adorable Condo in the Enclave at Briarcliff!